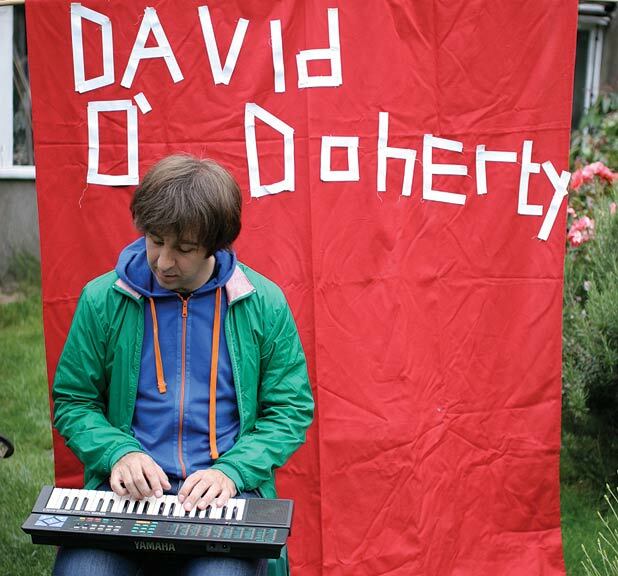 SHAGGY-haired, award-winning comedian; lover of technological gadgetry; the proud owner of very mild superpowers; globe-trotting music-lover with a penchant for vintage keyboards; quick-witted children’s book author: David O’Doherty is all of these things, and more. As one of Ireland’s best-loved comedians, David has forged a career based on quirky jokes that don’t require swearing, casual racism or sexism or anything else of that ilk to make them funny. Instead, he’s got a sort of style that, while described as “very low energy musical whimsy”, pulls the audience in on the strength of dry sarcasm and lo-fi, self-penned pop songs. David is currently in the middle of an Irish tour before making his way to the Edinburgh Festival once more in August. Having won the if.comedy award for his last Edinburgh show, 2008’s Let’s Comedy, he’s been busy writing new material. Rather than taking the “go to Achill island” approach and taking some time out alone to write, David prefers the action method, as he explains. “I need to be doing lots of gigs and taping them and listening back to them,” he says. “You think of good stuff when you are onstage – you are spitting out ideas, and good stuff comes from that. You don’t necessarily remember them after the gig,” he adds. With his current show, there is as always no central theme. “The last shows haven’t had a theme. I just like the idea of sticking a bunch of things together. If it is funny then enough people don’t question if it has a theme,” he says. So what does David think that a stand up show should do? “I think always that people should get a clear idea of who you are,” he muses. “It should really be a trip around your brain.” If David’s previous shows are anything to by, then this trip could involve mathematicians, sending a text message to the person the text message was about, relationships, badger attacks and monster keyboards. But for this show, one element will be all about the dark side of life – his vices. Oh, and a bit of serenading too. “I’m trying to figure out what all of my vices in life are,” he muses. “I also have a song that I try to serenade all the audience with.” Has he been successful so far? “They have been 100% serenaded,” he assures. In another section of the show, all of the people who have wronged him come and apologise to him on his deathbed. Practically all of the inspiration for his material comes when he is on tour. “Because I am on the road all the time at the moment I am always writing,” he tells me. Currently, his year is based around festivals in Edinburgh, New Zealand, Australia, Canada and Europe. It’s a continuous cycle so the need for new material is great. “You constantly need to have new hours and new hours of stuff,” he says. “I am one of those people who has writing on their hands all the time.” This writing, he says, includes “ideas and notions…things you say in passing”. Although David says his natural inclination “is to talk about things that happen in my life”, faced with a front row of octogenarians he says “all of these topics were out immediately”, leading to somewhat of an awkward set. But events like this are something he takes on the chin. “I think an important part of being a stand up is you take the knocks. You don’t want to just write jokes that everyone can get,” he says.